I feel honored to have read Malala Yousafzai’s story, which is why it also feels somehow both inadequate and inappropriate to write this review as if I Am Malala were just another book worthy of literary critique. I will start by saying, this book wasn’t at all what I expected; like several other reviewers, I anticipated more about Malala’s individual life experiences and less political background about Pakistan and the Middle East. I became bleary-eyed during the first third of the book by all the military groups and coups, the political parties, the government officials—some dirty; many ineffectual. I tried to follow (but couldn’t keep track of) all the acronyms of which group was which and who was on which “side,” something that Malala acknowledges wasn’t always clear to the Pakistani people themselves. But in the end, what came through loud and clear were two lucent voices—Malala’s and her father’s—from this maelstrom of fear, ignorance, and horrific violence that included suicide bombings and beheadings; U.S drone strikes that killed civilians and children; a devastating earthquake that took over 70,000 lives (not a typo); and floods that took out yet another 2,000. 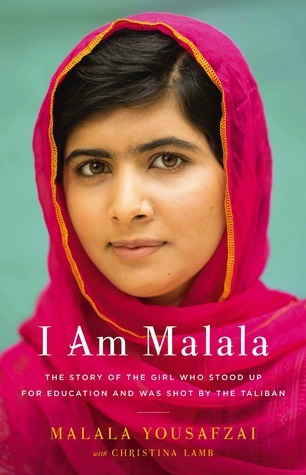 This book is easily two-thirds about Malala’s father and one-third about her, which is not surprising when you consider just how influential a figure he was in her life. Ziauddin Yousafzai is an ordinary man with an extraordinary heart, mind, and commitment to what is just and true. On the back cover, Malala is seen gazing adoringly at him; the love, admiration and respect she feels for her dad are palpable and well-deserved. That he could speak out for education and girls’ and women’s rights in the face of so many obstacles and threats—some directed squarely at him and his school, and others simply the generalized condition of his village and homeland—makes him a truly amazing model of the best humanity has to offer. One small example of many: When his own life was threatened, Malala’s father turned down the protection of bodyguards, explaining that if he is meant to die because of his beliefs, then he preferred to die alone rather than cause anyone else to be wounded or killed alongside him. Due to her personal tragedy, Malala has become a bridge between cultures, her story a needed salve in a world still dizzied and divided by the events of 9/11 and its aftermath. Although her perspectives are colored by both her culture and the influence of her family, her observations and story-telling are remarkably transcendent and even-handed, even while she voices a rarely acknowledged Pakistani viewpoint of recent world events. Her humility, faith, and good grace are beyond inspirational and should be an example for us all, especially those in the U.S. who still view all Muslims as savage, ignorant terrorists. Malala paid a harrowing price for her courage and commitment, as did her family. She is living testament that a single brave soul can, indeed, make a difference simply by speaking out. One cannot help but believe, as Malala does, that she owes her remarkable recovery not only to the invisible hand of God, but to the power of those millions who rooted and prayed for her. May Malala Yousafzai live a long and outspoken life; may she never again be silenced; and may she continue to use her hard-won notoriety to promote healing, peace, and acceptance the world over.